Oticon was founded in 1904 in Denmark, with the mission “People first.” Oticon’s history begins with Hans Demant, who wanted to find a hearing solution for his hearing-impaired wife. He traveled to England to find a device similar to the Danish-born Princess Alexandra, who was crowned Queen of England in 1902. Oticon began to import hearing devices from abroad, until World War II, when Demant’s son, William, began to craft their own devices in Copenhagen. From these early roots, Oticon has grown into a worldwide brand known for innovative technology. In collaboration with the Ericksholm Research Institute, Oticon hearing aids offer cutting edge design and customizable features to meet specific hearing needs. With over a century of experience, Oticon continues to lead in research and innovation. Oticon’s Velox Processing Platform analyzes and balances sound at an incredibly fast speed, which assists the brain in the listening process. Velox has a 64-band frequency resolution and a precise collection of algorithms to adapt to numerous listening environments. Velox’s success is located in Oticon’s ground-breaking BrainHearing Technology, a platform that assists the brain in the listening process. With the understanding that hearing occurs in the brain, Oticon’s hearing technology provides clear audio data to reduce listening effort. Velox improves upon previous Oticon platforms. With Velox, wearers have reported 20% reduction in listening effort in noisy environments and 20% greater capacity to remember in challenging noise situations. With improved speech recognition features, Velox provides wearers with 30% better speech understanding and clarity in noise. Compared to previous Oticon platforms, Velox processes data at 50 times the speed. Velox is central to the new Oticon OPN hearing aid, built with an open sound solution in mind. OPN, pronounced “open,” is a sophisticated hearing aid from Oticon that provides wearers with an open sound solution. Unlike other advanced hearing aids of this kind, OPN captures all sounds in a wearer’s environment. While traditional hearing aids provide focus in complex listening situations, thus limiting the scope to a narrow cone, OPN opens up the audio landscape for wearers. With unfettered access to a wider sound picture, OPN empowers the brain to decide where it wants to focus. As such, OPN provides significant cognitive benefits. OPN hearing aids provide an open sound by scanning your listening environment at 100 times per second, providing 360-degrees of crisp, clear sound. Independent studies have found that OPN’s Open Sound Solution reduces listening effort and helps wearers understand speech with a 30% improvement from previous models. OPN aids offer features such as OpenSound Navigator Environmental Analyzer, which scans the full 360 degrees of a wearer’s listening environment and provides direct access to sound. Other features available with OPN include SpatialSound LX, YouMatic LX, SpeechGuard LX, Soft Speech Booster LX, and more. Together, these features bolster the natural sound experience you receive with OPN. Additionally, OPN is a wireless hearing aid and connects to your smartphone with Bluetooth to provide more accessibility. OPN is a mini receiver-in-the-ear hearing aid. Opn miniRITE is now also rechargeable. An easy overnight charge gives you full power for the day without the hassle of handling batteries. 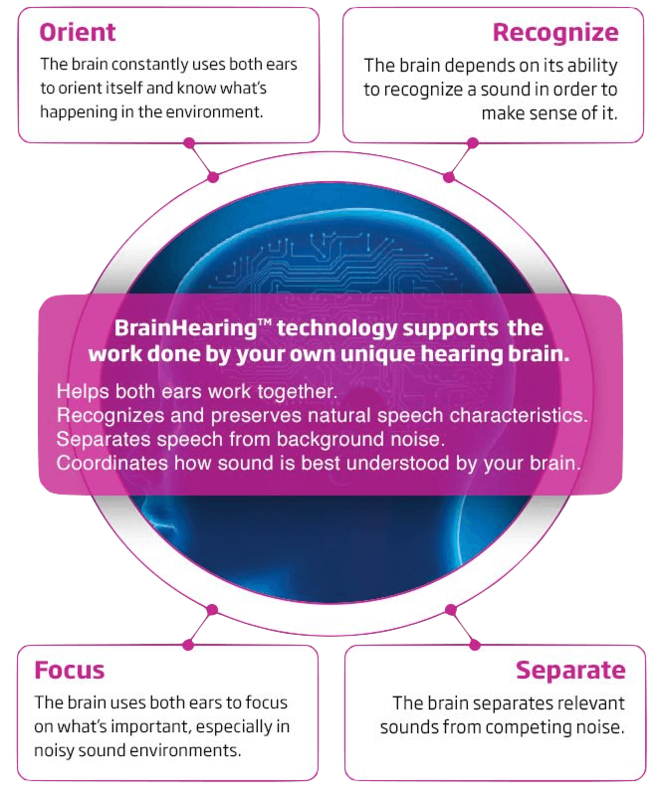 Oticon is known for its sophisticated BrainHearing Technology, which supports the brain in the listening process. 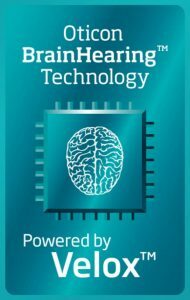 BrainHearing Technology is available in Oticon hearing aid families such as Alta, Nera, and Ria. YouMatic: personalizes your hearing preferences and automatically adjusts depending on the situation you are in. Alta, Nera, and Ria hearing aids are built on the BrainHearing Technology platform, and are available in the following styles: in-the-ear, behind-the-ear, and custom-made completely-in-canal and invisible-in-canal. Certain models of Alta, Nera, and Ria offer tinnitus therapy, as well as wirelessly connectivity to your smartphone and home entertainment systems. For people who experience higher degrees of hearing loss (severe to profound), Oticon offers Sumo and Dynamo hearing aids. Even with advanced features and incredible access to sound, there are situations where wearers may need an extra boost or assistance. Oticon offers accessories to improve your listening experience. ConnectLine is a home entertainment accessory, that allows you to stream audio directly to your ears. Oticon also offers remote controls to assist wearers in making adjustments with discretion and ease.